The slicer VA2000 is fully automatic, programmable, fast, clean and efficient. It is Ideal for large kitchens, delicatessens and processed meat works. This machine slices, collects, stacks or shingles products, all in one operation, with pre-programmable push button operation. All components in contact with the product being sliced are manufactured in stainless steel, the ultimate in food safety. Gear driven blade for maximum power. Teflon blade available as an optional extra. 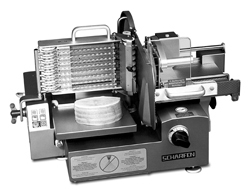 The VA2000 food slicer is fully automatic, programmable, fast, clean and efficient. Ideal for large kitchens, delicatessens and processed meat works. This machine slices, collects, stacks or shingles products, all in one operation. Pre-programmable push button operation. All components coming in contact with the product being sliced are manufactured in stainless steel, the ultimate in food safety.